Injection Moulding specialists, Sovrin Plastics will in July move to a new, purpose built 43,000 sq. ft. (4,000 sq. m) manufacturing facility, which will house its tooling, cleanroom injection moulding and assembly divisions. The new, state of the art facility represents a £4.5 million investment in Sovrin’s future and features some of the latest injection moulding, automation and material handling technologies. With a primary focus on lean manufacturing and benefitting from 50 years of technical injection moulding and assembly expertise, Sovrin has designed the new manufacturing site to improve utilisation and efficiency whilst significantly reducing its carbon footprint. This development exemplifies Sovrin’s policy of continuous investment for the future, constantly enhancing the capabilities and supporting its ever developing customer base. The new facility will house 36 all electric injection moulding machines with robotic handling in class 8 cleanrooms and White room areas. The moulding facilities are complimented by a 650 sqm cleanroom area for manual and automated medical device assembly. A further 300 sqm is available for future expansion or a dedicated customer manufacturing cell. Construction began in July 2014 on a brownfield site, close to its existing manufacturing sites and is due to be completed in July 2015. The move from old to new facilities will be phased over a number of months to ensure a smooth transition and the revalidation of processes. 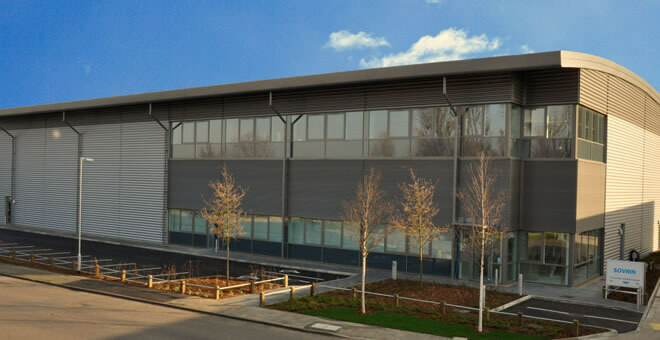 The current class 7 cleanroom facilities, housing moulding, assembly and medical device manufacture, which neighbours the new build will be retained. Two-shot moulding machines will be housed in class 8 cleanroom. Sovrin plans to have an open day later this year to showcase its new facility to its customer and supplier partnerships. If you are interested in having a tour of the new facility, please send an email to tour@sovrin.comwith your contact details. If you require any additional information about out new facility or have a project that requires tooling, injection moulding or device assembly, please do not hesitate to contact us.